Keep stocks for dividends or sell? This month's Share Market eNews email is going to all of my subscribing Share Market Toolbox Members as normal, and to the non-Members who have expressed an interest in receiving it. should I keep my stocks for the dividend? or sell to protect my capital? For a while now I have wanted to revise the timing for this eNews update, and with this month's topic I have bitten off quite a big junk of material to cover off. So this eNews issue is a bumper version across the two months of July and August. And I am planning to issue future editions in the first half of each month. So, this month's bumper topic is addressing the question: In a falling market, should I keep my stocks for the dividend? or sell to protect my capital? See all the details below. Just a short note to the recently new Toolbox Members:- These share market eNews emails always go to Toolbox Members (a part of the Toolbox service), and to the people who have registered to receive occasional information about the Share Market. This is a monthly email with some pointers and tips on focused topics - see a quick intro to the eNews emails. They often include references to specific eBook Articles in my Share Market Toolbox, as well as key web pages in the free area of the Toolbox (eg. on the extensive Share Market web page). I have been writing the eBook Articles since October 2008 - that's more than four years, and these eNews emails help you to navigate to related and useful information each month. In falling markets, keep for dividends? When a bear market is under way, and potentially ravaging our share holdings just like bear markets have done before, is it really worth holding on to our beloved stocks for the dividend income? Or should we strategically sell the stocks to protect the profits and capital? Many investors simply tell themselves that they are holding their stocks for the dividends. But in reality, is this the best approach? Unfortunately, the information presented in the web pages and eBook Articles mentioned below might not be what buy-and-hold investors really want to hear. Hold the stocks through any possible market conditions. Strategically sell off the stocks using a basic exit strategy. And which of these two options do you think performed the best over the 6-year period from July 2007 to June 2013? The answers are in the materials listed below. And why do some people still ignore the logic of a sound argument? It's to do with cognitive biases, and is briefly discussed at the end of the eBook Article ST-6050 (see link below). Sell in a falling market? or keep for dividends? The "Keep stocks for dividends?" presentation - All this material has come about because of the slide presentation that was prepared in late 2010, and presented to a couple of public groups, then updated in July-August 2013. See the latest version in the Toolbox (after Thursday 22 August - Toolbox Members will be notified in the regular Weekly email update). New public web page: In a falling market keep for dividends or sell? This public web page provides an introduction and initial discussion for the topic. New Members web page: In a falling market keep for dividends or sell? This new Members only web page provides more information on this topic, including the overall $100k portfolio performance, the actual amount of dividends received, and details of the exit strategy. Article ST-6050, "Keep for dividends?" - This new 8-page eBook Article covers the same topic, but with even more information, and more explanatory comment. (Non-members can see the free page 1). Moving Average explained - For those who would like to see some basic comment about the Moving Average indicator, we have a Moving Average explained web page, and an earlier free eBook Article TA-4205, "Moving Average (MA) explained". The web page includes links to other materials to do with moving average (eg. MA Cross-over and GMMA). 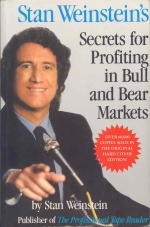 Article ST-6410, "Sample trading strategies - Stan Weinstein" - This 7-page eBook Article has been revised and updated, and discusses the ideas that Stan Weinstein published in his infamous book of the late 1980s - Stage Analysis, and weekly Moving Average on weekly price charts. Article TA-6100, "Weinstein's 30-week SMA + Stage Analysis" - This 4-page eBook Article discusses Weinstein's ideas more from a technical analysis point of view, and touches on other ideas that are discussed in his book: the Advance-Decline line, market momentum, new-highs new-lows and the price/dividend ratio. (Non-members can see the free page 1). Article BC-26-100, "Author Strategy - Stan Weinstein" - This 7-page eBook Article (published in 2009) describes several of Weinstein's ideas that are implemented in the BullCharts charting software as "Author Strategies". This includes several market scans (to easily find stocks meeting specific criteria) as well as chart indicators and a sample chart template. Also see eBook Article BC-26-050, "Author Strategies - what are they?". Don't forget to see the updated Table of Contents pages for all articles (see links in the side-bar at right). There are now a total of 134 Articles in this collection of eBook Articles - a whopping total of 613 pages of information! You can see the Table of Contents for all eBook Articles here (recently new or updated ones are highlighted), and the Master Toolbox Index here.